Hopefully you’ve gotten a chance to get up on the mountain and enjoy this strong start to the year! Keep the snow dances going! The trails are in and the safety shelters went out on Wednesday night. We’ll be working to get the beacon check stations in this weekend: one at the Brooklyn Lake turnoff near the GreenRock trailhead [junction of U & O trail] and the other on the West side at the Chains End parking lot. We encourage you to make a quick stop and check that your beacon is transmitting correctly using these convenient check stations this season. Big thank you to Front Range Powersports, TNT Motorsports, and Frontier Cycles for the partnerships to provide these! This month’s meeting will be next Wednesday evening at 6:30 pm, at Laramie Fire Station #2: 1558 N. 23rd Street, Laramie. We hope to see you there. The parking situation on the southern end of the Range has been resolved, with a plowing contract filled for the Tic’s parking lot [off Wyoming Highway 230, between Foxpark & WyColo Lodge] for the ’18/’19 winter season. I’ve driven by twice and each time the lot was open and cleared, ready for easy trail access. For those of you venturing north toward the Bighorn Mountains this season, Jeremy Bock at Z Bar Cabins & Motel in Buffalo, WY has graciously extended a 30% discount offer to all of our club members. 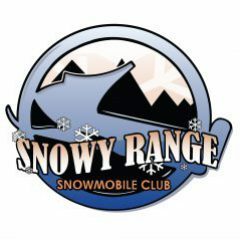 You can check them out here or give them a call at: (307)-684-5535, just be sure to tell them you’re a Snowy Range Snowmobile Club member for the discount. We hope that the summer served everyone well and I know that we are all ready for the snow to start piling up. When this time of year rolls around its time to start making sure that the warming huts are ready to go and that the wood supplies at each location are adequately stocked. This year we will do hut maintenance on the mountain. The huts are located up above Rob Roy Reservoir. We need to try to get one more year out of the floors so we will be cleaning the hut top to bottom prepping the floor and painting them like we did 2 years ago. First date of this will be Sunday September 16th. We may be able to get them both completed but if not we will reserve the following Sunday also. If the turn out for this is very good we can split into 2 groups and the second group can travel to the Nelson Hut area and cut firewood. If you are available for either the 16th or the 23rd of September please let us know either by email or on FaceBook. We will get to the Quealy hut area either the last weekend in September or the 2nd weekend in October and we can do that either Saturday or Sunday based on volunteers. This year due to scheduling conflicts with where we have the meetings most of the meetings will be held on the 3rd Wednesday Evening of the Month. Please see schedule below. First meeting of the season we will elect new officers (we need a Secretary/ Treasurer but all offices are open for replacement if need be) we will also make sure that we get any unfinished hut activities scheduled. All meeting will start at 6:30 and we will try to wrap up in about an hour. Any questions or to help out with this falls activities please respond to this email and if you or someone you know is interested in an officer position with the Club please let us know also. Our January meeting will be Thursday, January 18th at Laramie Fire Station #3, 2374 W Jefferson St. Dinner will start at 6:00pm, with the meeting starting at 6:30pm. In light of recent events on the Snowy Range, we thought it would be a good idea to invite the Albany County Sheriff’s Search & Rescue to come visit with us about how we can best help when an event occurs and to inform folks on how to get involved with SAR. This will be our normal club meeting but is open to anyone and everyone–the more we can educate everyone, the better prepared our community to deal with an emergency. Please join us on Feb. 15 at Laramie Fire Station #3 at 2374 W Jefferson St at 6:00 pm. If you have any questions please let us know. Hope to see you all there! 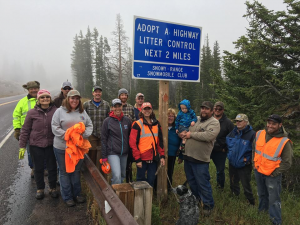 We had a great turn out for the Quealy wood cutting and highway cleanup. We had 20 people show up to brave the fog, rain, and snow. We would like to say a special thank you to the 6 members of the Colorado Blizzards Snowmobile Club who traveled all the way up from Colorado to help us. The Nelson wood cutting will be on Saturday, October 14th. We will be meeting at the West Laramie McDonalds at 9:00 am and heading up the mountain shortly thereafter. Please bring chainsaws, axes, and splitting mauls if you have them. The club will provide a hot lunch and water. If you have any questions, please contact us. We hope to have another great turn out! 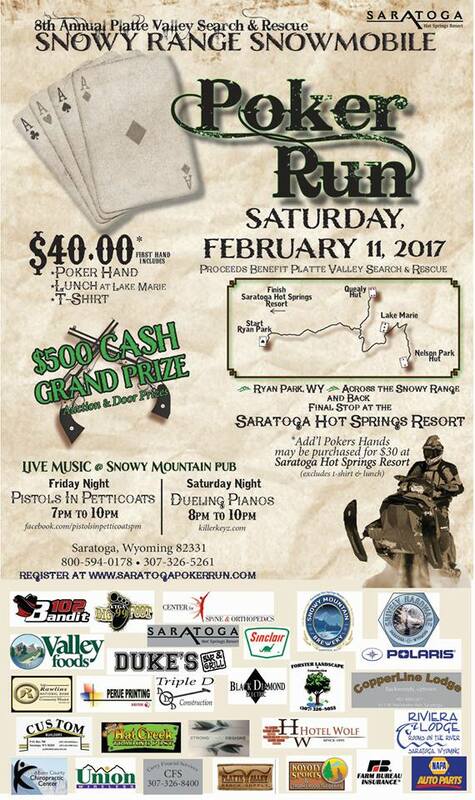 The 8th annual snowmobile poker run event hosted by the Saratoga Hot Springs Resort. Check out the new interactive map from Wyoming State Trails! Follow the grooming schedule over the last 72 hours! Presented by Brian Lundstedt with Tyler’s Backcountry Awareness, the course is your first step towards riding safer and ensuring that you will always have another ride. We will cover terrain identification, group and terrain management and companion rescue. Friday will be classroom style, 6pm-9pm (location tba) and Saturday will be on the snow, 8am-5pm. (You must do classroom portion to do the on the snow training). Attendance is free, donations to TBA are encouraged. To register email us at: srscwy@gmail.com or message us on Facebook. GeoPDF maps are new this year from the Wyoming State Trails Program. Download the Avenza Maps App to your favorite GPS enabled smart device. Download the Snowy Range Wyoming Trail Map from the map store or from the state trails website. p.s. Other Wyoming snowmobile trail systems also available.